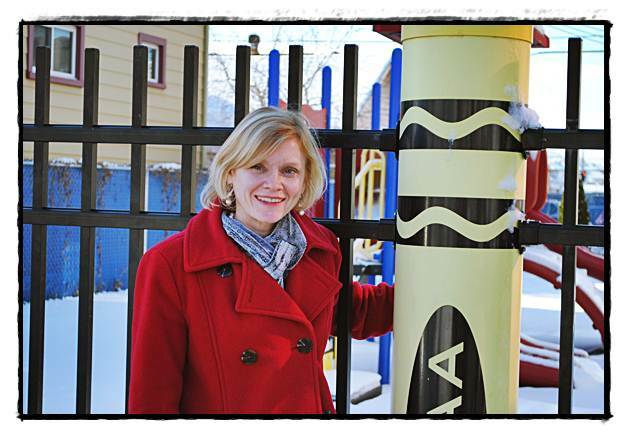 Who she is: Named the 2008 Toyota Literacy Teacher of the Year, Katy Kibbey is the Family Literacy Director for Wayne Metro Community Action Agency. She oversees the Even Start Family Literacy program, which provides adult education, parenting development, parent-child interactive literacy and on-site early childhood education for the children of enrolled adults. Katy is also in charge of the Early Learning Communities, a program that provides child development training workshops to any caregiver of young children from birth to age seven. In addition, she coordinates both US Citizenship and computer classes at the Wayne Metro site for the community at large. And if that’s not enough, she volunteers as the secretary of Hamtramck United Social Services (HUSS). We recently caught up with Kibbey to find out more about what she does. Wow, that’s quite an impressive bio – there wasn’t even enough room to include the fact that you got your undergrad degree from the University of Michigan in Honors English/Communications and a Master’s in Literacy Education from Madonna University. It seems like you’ve always been pretty busy, how do you find time to balance your work and private life? Or by now have the two become one-and-the-same? Kibbey: The term workaholic would apply to me, but it’s only because I have a strong work ethic and truly enjoy my work. I do try to keep work and life in balance, but like everyone, I sometimes have to remind myself to stop and smell the roses. That’s an interesting way to look at it. Speaking of professional life, before coming to Wayne Metro in 2002 you were a third and fourth grade teacher in the metro-Detroit area. How did you make the transition from teaching to administrating? Was it hard to leave teaching behind, or was it a natural step in your career course? And what was your favorite part about the job? Now that you work at Wayne Metro, what’s a typical work day like? Most people know the Wayne Metro building by the giant crayons on its fence, but what exactly goes on in there? Kibbey: Wayne Metro’s Early Childhood Center is a busy place everyday! In addition to our Even Start program, we provide on-site Head Start services to over 200 children. Our agency outreach staff also provides weekly office hours for Weatherization services, Employment and Training assistance, seasonal Tax Preparation, and Michigan Enrolls. Our Early Learning Communities also offers weekly workshops on child development for parents and other caregivers of young children. In addition to working at Wayne Metro, you are also actively involved in HUSS. In fact, if I have to say so myself, you practically keep the organization running by keeping everyone updated and informed through your role as secretary. What brought you into the fold at HUSS, and, even though your plate is already full, why do you think it’s so important to volunteer? Kibbey: I first attended a HUSS meeting at the invitation of one of my colleagues, who was serving as HUSS President at the time. Through my attendance at meetings I was able to make connections with other local Hamtramck non-profits and organizations who have become great partners to our agency. As secretary, I enjoy being able to facilitate the sharing of resources and event announcements among the members. I know firsthand that that because of the resource sharing of HUSS members, many of my program parents and children have been able to access services and supports in the city that they would otherwise not have. What’s your favorite part of working in Hamtramck? And what’s your favorite part about Hamtramck in general? Kibbey: I love Hamtramck’s diversity. Our program participants are some of the hardest working, motivated, and generous people I have ever met- which is also symbolic of the city. I love the relationships my staff has built with our participants- nothing makes me prouder than when a parent gets their GED or graduates from our ESL program or when they come back months and years later to tell us about new successes in their life. Switching gears, let’s talk about your private life a little. Are you originally from the Detroit area? Are you married? Kids? What do you like to do in your spare time? Kibbey: I grew up in Detroit and Northville. I just celebrated my second wedding anniversary. When not working, I like to exercise (pilates, tennis, running — I like to run 5 and 10Ks– read, and travel; when I get the opportunity). Just two more questions. First, since you’re a huge advocate of reading, what’s your favorite book? And since it’s next week, what’s the one thing you definitely want for Christmas? Kibbey: My favorite adult book is “To Kill a Mockingbird,” and my favorite children’s book is “Where the Wild Things Are.” My Christmas wish is just continued health and happiness for those around me. Wayne Metro is part of the National Community Action Network, an initiative to help lift people out of poverty, improve lives, and make our community a better place to live. For more information about the services available at the Hamtramck site stop by 12031 Mitchell Street or call (313) 369-4600.